A Nigerian soldier who survived the deadly attack on a military base in the northern part of Borno State on Monday said they suffered a heavy casualty due to lack of adequate weapons. He said the corpses of the slain Nigerian soldiers are yet to be evacuated, days after Boko Haram took advantage of their lack of munitions, and dealt them a devastating defeat. The attack at Metele village in Guzamala local government area of the state happened on Monday evening. PREMIUM TIMES broke the story on Tuesday detailing how rampaging Boko Haram insurgents overran a Nigerian Army battalion in Borno State on Sunday, killing the unit’s commander and dozens of soldiers. Military sources told PREMIUM TIMES that large cache of arms, ammunition, and military equipment were carted away by Boko Haram fighters during the attack on 157 Task Force Battalion in Metele, Guzamala Local Government Area, at about 6:00 p.m.
Security analysts described the attack as a huge setback for government forces trying to push terrorists further out of Nigeria’s north-eastern flank. The attack came amidst rising fears for the fate of the troops from the base, which has suffered several attacks in recent past. 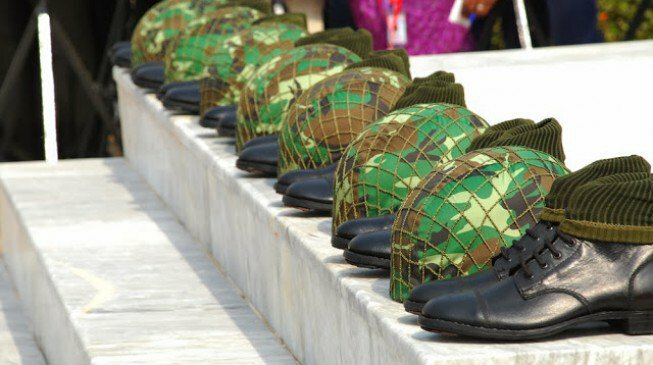 PREMIUM TIMES reported on Monday that there were efforts being made to evacuate corpses of the fallen soldiers on Tuesday morning. But according to some of the soldiers who survived the attack, the move to evacuate the littering corpses was thwarted by the Boko Haram fighters who held their ground and forced the soldiers to abandon the mission. According to the soldier who survived the attack, their location was invaded after Boko Haram allegedly issued a threat letter last Friday that it would soon take over four strategic military locations around the Lake Chad region. PREMIUM TIMES has not been able to see or confirm any copy of the threat letter mentioned by the military sources. “The attack came at about 6pm on Monday evening”, said the soldier. “When the soldier on top of the observation post alerted that a large number of Boko Haram fighters were advancing, we all got alarmed as we took cover and waited within the base in Metele. “The fight did not last for more than 45 minutes; but it was bloody because the Boko Haram fighters had more armament advantage that the soldiers. “When we realised the fight would be against us, we decided to retreat from the camp, but it was rather too late. The camp was surrounded with barbed wire, and the enemy fire was coming from the direction of the entrance. We were like surrounded. “The Boko Haram made away with about seven gun trucks of the Nigeria army. The senior non-commissioned military source said no fewer than 70 soldiers were killed while many others who were outgunned by the Boko Haram fighters had to flee. The soldier, who claimed to have made it to Maiduguri on foot after escaping the heated battle, said an attempt to return to the battlefield to evacuate the bodies of the fallen heroes was thwarted by another attack from the insurgents. The soldier, who pleaded strict anonymity in this report, informed PREMIUM TIMES that troops in the field are still facing serious challenges of inadequate ammunition and motivation. The soldier said the deployed team that went to evacuate the bodies of the soldiers could only pick about five corpses before they suffered yet another ambush attack from Boko Haram fighters, forcing them to abandon the mission and fled. “Up till yesterday, Wednesday, the evacuation of the corpses have not been completed, to the best of my knowledge,” he said. The source said troops have been recording death of many soldiers almost on a daily basis as Boko Haram sustained attacks on military formations. “We need the world to hear how we are being sent to slaughter as though our lives don’t matter,” he said. It could be recalled that on August 12, a group of soldiers stationed at the Maiduguri International Airport staged what seemed a mutiny following a protest over military authority’s move to redeploy them to the frontline. The military command in Maiduguri dispelled the claims of the soldiers and some of the revolting soldiers were later court-martialled. The source to this report said despite the protest and the subsequent court-martial, some of the soldiers that were deployed still suffered the fate that befell their colleagues. “Some few weeks ago, about 75 of us from our own unit here in Maiduguri were deployed to the front line and it took the grace of God for about 40 of us to return alive. “When we returned and gave our complaint, we were asked to go back again to Metele, an area near Kangarwa forest, and we have been there for about three weeks now fighting a defensive battle. “We beg the Nigerian media to help us by echoing out our muffled voices. The children of poor Nigerians have been turned into chicken meant for easy sacrifices by our commanders. “We are being killed on daily basis as if our lives don’t matter. Of course as soldiers we signed to lay down our lives in defence of this country, but certainly not in the manner we are being presented for slaughter without dignity. A soldier should die fitting and not being chased or overpowered. “The situation has gone so bad that it has gotten to a stage that soldiers would be rushing to pack up their camps and flee upon hearing the news that Boko Haram fighters are advancing. “The media need to give this clear picture to the world – Nigerians need to know what we are facing here in the battlefield. Only some of us that escaped managed to get to Maiduguri on Tuesday, but many others are yet to surface. “The fact of the matter is that we still have a very large number of Boko Haram terrorists out there. As far as the Nigerian army is concerned, it will take more than ten years to chase out Boko Haram from our hinterlands, without the help of foreign forces. Metele is, for now, regarded as one of the strongholds of Boko Haram in the northern part of Borno State. It could be recalled that it was in Metele that about 18 Nigeria soldiers were killed and about 151 soldiers and six officered were declared missing when insurgents raided an outpost of 157 Battalion on October 8. The military had reported that it had killed at least 76 Boko Haram fighters in Metele while giving seven soldiers dead and 16 injured as the official figures of casualties recorded during the attack no troops’ location. The military, both at the army headquarters, Abuja and at the theatre command in Maiduguri, have not responded to text messages sent to them by PREMIUM TIMES for this report.